Some walks just grab you so hard that you know you’ll be back to enjoy them again, if not sooner then later. It was a good five years since I’d last set off from Alfriston, but nothing had changed in this lovely corner of East Sussex. 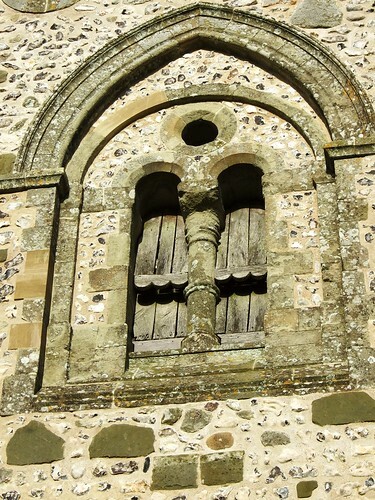 The same clear-cut line of the South Downs above the village, running down to their final embrace of the coastal flatland; the same eccentric old carvings in the Star Inn’s frontage; even identical late winter weather, a cold blue sky arched over Alfriston, calling me up to the hills. A covey of partridges burst whirring out of the root crops as I went up the flinty, half-frozen path onto the roof of the downs. Views were wide and wonderful – the North Downs a grey-blue line 30 miles to the north, the green billows of the South Downs riding up and away into the west, Alfriston lying with its stumpy church spire and tiled roofs like a village in a Brian Cook book jacket, all flat angles in bright brick reds, acid greens and indigos. The cold air stung my nostrils and smoked my breath. 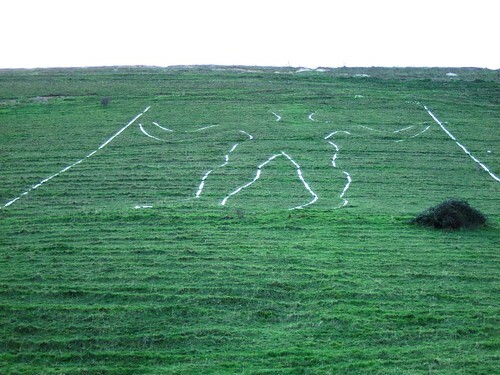 Descending to pass below the Long Man of Wilmington, I saw that spiders had strewn the ancient chalk-cut giant with a maze of cobwebs, so that the 200-ft figure sparkled as though encased in diamonds on its steep hillside. 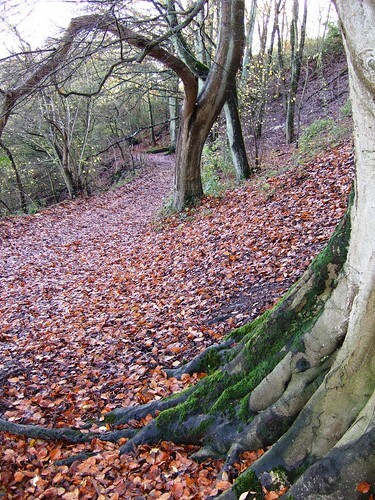 Frost clung in tight curls to the muddy ruts of the path that led through the woods to Folkington. 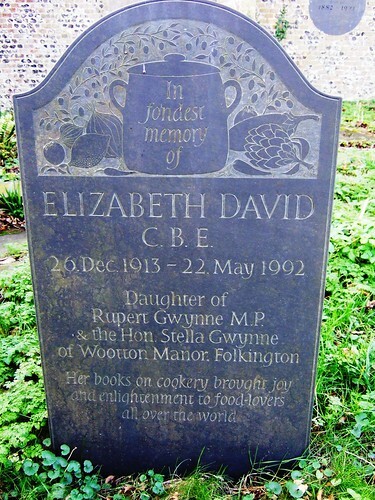 Elizabeth David lies in the churchyard under a gravestone carved with aubergines, peppers and cloves of garlic. Celebrity chefs are twenty to the teaspoonful nowadays, but she was the first, a post-war culinary pioneer who introduced beige British tastebuds to snazzy foreign flavours, a shock from which we’ve never recovered. A snaking old track brought me south to Jevington with its cheerful Eight Bells pub and thousand-year-old church tower built like a fortress against Viking marauders. 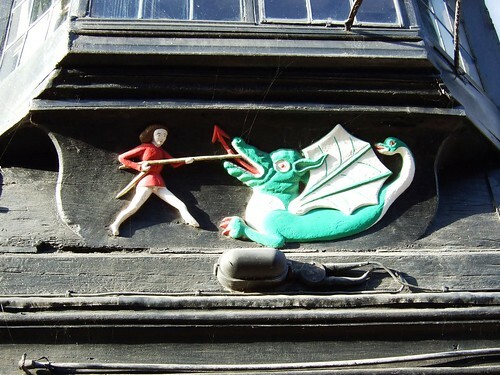 A Saxon Christ adorns the wall, victorious over a puny, wriggling serpent. Crossing the downs on the homeward stretch, I marvelled at how a corner of countryside with such a vigorous and bloody history – Viking and French raids, coastguard battles with the smuggling gangs, Second World War bombs and doodlebugs – has settled to a tranquillity as smooth as the applewood smoke rising from Alfriston’s chimneys into the blue Sussex sky. Getting there: Train (www.thetrainline.com; www.railcard.co.uk) to Eastbourne; bus 126 to Alfriston. 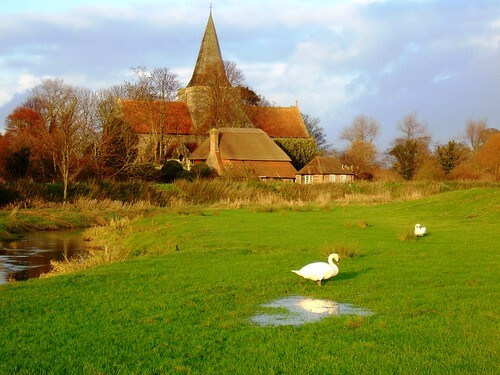 Road: Alfriston signed off A27 (Brighton-Eastbourne), 5½ miles after A26 Newhaven roundabout. From The Willows car park (521033), follow footpath by wall on right of coach park. Cross stile; right to cross another; right along river bank; left across White Bridge (522031) to road. Cross road; take footpath on right of house. In 20 yards up steps; on up hedged path. In 100 yards, left through hedge (525031 – South Downs Way/SDW marker post); diagonally right on path across field; through hedge; across next field to cross stile onto SDW (532033). Right to cross road; follow SDW uphill past Windover Reservoir to go through gate into Access Land (538035). SDW continues ahead, but turn left along fence over ridge; in 30 yards, right along track, through gate and on for a mile, passing Long Man of Wilmington (542034) where you join the Wealdway path. At The Holt, through gate into wood (551040); right along track for ½ mile to St Peter’s Church, Folkington (559038). Bear right (as you approach church) along Wealdway for just over a mile to T-junction of track; left (561021 – ‘Wealdway’ arrow) to road; right through Jevington, passing Eight Bells pub (563017). Continue for 100 yards to left bend; take path on right of road to St Andrew’s Church (562015). On up SDW for 2/3 of a mile to Holt Brow (553019). SDW turns right here, but keep ahead for one and a quarter miles through Lullington Heath NNR, passing Winchester’s Pond (540020), to fork (533020). Keep ahead (‘Litlington’), down to road (523021). Left past Litlington church. Just before Plough & Harrow pub, right (523017 – ‘Vanguard Way’) to Cuckmere River; right along bank for 1 mile to Alfriston. 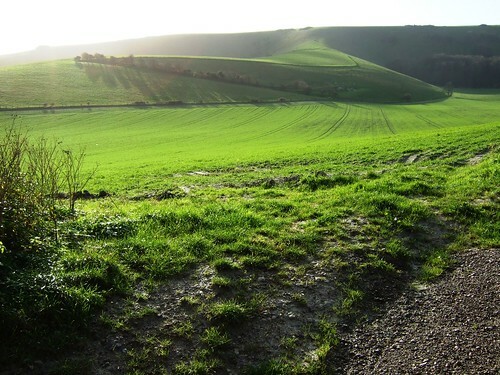 We walked the Alfriston walk this week. It was pure heaven. 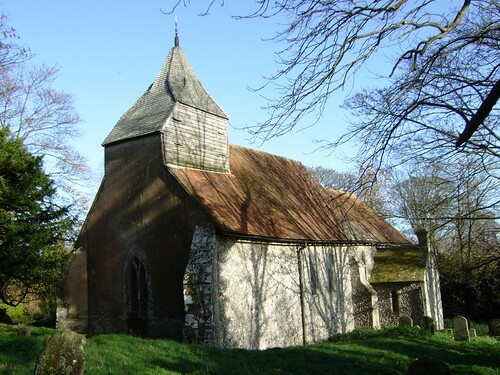 Misty sunshine, over the rolling expanses of the Downs, vivid green wild garlic in the woods coming through, primroses in St Peter’s Church – what a peaceful spot – saw and heard different birds including a tree creeper. It was just the right length of walk – pub lunch sitting outside (in March!) at the Eight Bells and then cream tea as a reward back in Alfriston. What a joy the day was. Well, I don’t think I have ever had such a lyrical and delightful thank you – so thank you! I’m so pleased that you did this walk on a day like that – it really is a beauty, and having by coincidence been reading this week about Edward Thomas and Eric Ravilious, I can picture your ‘pure heaven’ in its proper setting.